The Journal is a web-based program intended to help individuals with mild to moderate depression or anxiety. The intervention is based on the notion that small behavior changes can assist in improving the well-being of those struggling with mental health issues like depression and anxiety. The program starts with a brief self-test aimed at identifying symptoms of depression and/or anxiety. The program consists of 3 modules: how to stay positive, making lifestyle changes to improve mental health, and problem solving. Within each module, skills are taught in the form of short lessons (video/transcript), accompanied by homework on the incorporation of practical changes into one’s daily life. Each lesson requires about 20 minutes and then skills practice takes place over one week; however, users can complete the lessons at their own pace. 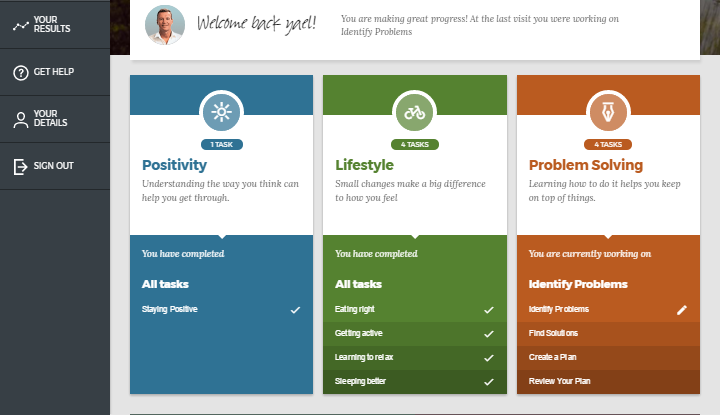 Additional features include a text-based self-help section with recommendations on lifestyle changes; the option for users to receive email/text reminders for each lesson and the practical tasks they are required to do; testimonies from individuals who have suffered from depression and anxiety in the past and their road to recovery; and information on local crisis management help lines. Relatable narrator/ Short, easy-to-achieve tasks. Program’s design is outdated/Not an A-to-Z full program. The Journal’s design is more suited to teenage and young adult age groups. The informational videos are easy to understand and the same instructor leads users through the different tasks; this helps to create a comforting and pleasant experience. The Journal, however, is not a comprehensive program: It seems that the tools offered in the program only partially cover the treatment strategies they were drawn from – such as behavioral interventions or problem solving. Therefore, the program would likely be more helpful to those experiencing mild symptoms or as an adjunct to treatment. The program’s design at the time of review seemed outdated. For example, despite the simplicity of the therapeutic activities users are asked to complete, the program’s features often make it more difficult for users to complete these activities (e.g., asking users to cook a healthy meal by finding one from a list of recipes, instead of the more user-friendly option of identifying their desired meal). The Journal can be added as a supplement to treatment for patients who would benefit from an additional boost to encourage change in their daily routine, and who have sufficient energy to complete the recommended activities. The program’s design makes it most suited to the teenage/young adult age group. The therapist could make tasks easier to complete by discussing them with the patients and helping patients to prepare for the activities.